Properties in Bay of Cádiz average 4.6 out of 5 stars. Apartment "La Bulería". In the old town of El Puerto de Santa María. 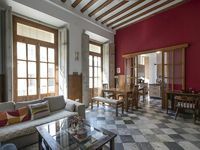 Property 2: Apartment "La Bulería". In the old town of El Puerto de Santa María. Come, we wait with affection in your second home. Property 21: Come, we wait with affection in your second home. Property 26: Apartment 600m from La Barrosa beach, with swimming pool and paddle tennis courts. Elegant Apartament by the Sea !! Property 29: Elegant Apartament by the Sea !! Property 31: IDEAL LONG OR SHORT VACATIONS, NEXT TO THE BEACH, WITHOUT COLD OR HEAT. Property 32: San Isidro apartment, comfortable and central. Luxury apartment with panoramic sea views and cruise ship dock. Property 34: Luxury apartment with panoramic sea views and cruise ship dock. PRECIOUS PENTHOUSE SITUATED IN THE CENTER OF SANTA MARIA. Property 38: PRECIOUS PENTHOUSE SITUATED IN THE CENTER OF SANTA MARIA. Property 40: City apartment, free wifi center. Lovely Loft in Palace House. heart of Historical Quarter. Unforgettable Holiday. Property 41: Lovely Loft in Palace House. heart of Historical Quarter. Unforgettable Holiday. 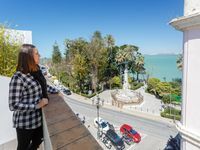 Raquel offers a beautiful home to travelers lucky enough to come to Cadiz. A full American sized kitchen (rare in Europe), vaulted ceilings, and enough space for me and my husband, my sister, and our two children. The home is in the middle of the busy historic district, lots of pedestrians and an open market, which we loved. It was walking distance to all the beaches, restaurants, and shopping. We would not advise renting a car - much better to walk around here and taxis were easy to come by if you want to venture further. The only downfall was it's a bit noisy - the open areas of the building allow sound to travel and there was construction in our building during our stay. But other than that we loved staying here and would recommend it! We loved this apartment. with two rooms and two bathrooms. It was perfect for a couple and a single adult. Very clean and well appointed. Kitchen had everything we needed. The deck overlooking tyhe water is spectacular. The garage elevator parking was a bit tricky the first time, but fine once we figured it out. Perfect location - everything is in walking distance. Cannot wait to return! Easy to get our keys and good communication all the way through the process.